COME MEET THE FATHER OF MODERN COMIC BOOKS STAN LEE!!! Held at the LOS ANGELES CONVENTION CENTER Comikaze Expo is Los Angeles’ first and only large-scale, multi-media pop culture convention. We bring together the most exciting and innovative in comics, video games,sci-fi, fantasy, horror and all things POP CULTURE. Our goal is to provide an unparalleled and unforgettable experience for both attendees and exhibitors. EACH TICKET HOLDER WILL RECEIVE ONE (1) OF THEIR CHOICE OF THE FOLLOWING LITHOGRAPH- CAPCOM,OR FRANK WORTH PHOTOGRAPH. LITHOGRAPHS ARE VALUED BETWEEN $79-$200. Comikaze has more to offer than any other convention. Our unique panels, autograph sessions and photo-ops give fans once-in-a-lifetime opportunities to truly interact with their favorite creators and major players in the entertainment industry. Comikaze embraces all genres, including sci-fi, fantasy, horror and cult—our vendors and panels show similar diversity. We offer something to satisfy every type of convention-goer, from fanboys and gamers to browsers and collectors. Our sanctioned tournaments for video, card and board games feature a wide-range of coveted prizes, including cash awards. Our vendors sell exclusive, rare and limited editions of comics, collectibles, art, toys and other hard-to-find merchandise. Best of all, Comikaze culminates in a masquerade event that partygoers will never forget. 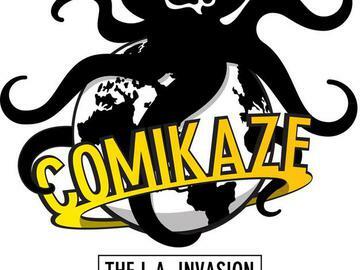 The Comikaze team strives to create a cohesive community around this Los Angeles-based event.. We truly believe that Los Angeles is a city of dreams and magic, and we want to help make dreams come true for everyone. •Vouchers will be given for Lithographs. Lithographs can be chosen from COMIKAZE EXPO website and will be mailed to Attendee. Attendee is responsible for shipping and handling .